Description: While the commercial growth of pecans did not begin until the 1880’s, it is one of the latest domesticated major crops to be commercialized, pecans were greatly enjoyed by Native Americans and colonists in its native U.S.A. It is believed native Americans were the first to cultivate the pecan tree and pecans were enjoyed by European explorers venturing to the new world. As with many American colonists, both Thomas Jefferson and George Washington were greatly fond of pecans and grew pecan trees in gardens at their homes. Today the United States is the leading producer of pecans and produces over 80% of the world’s supply with Georgia being the leading state. 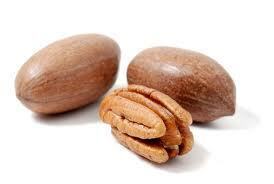 The word pecan comes from an Algonquian word meaning a nut requiring a stone to crack. While its shell certainly is hard, it is far from impenetrable and the nut itself is 1-3 inches long and oblong shaped. The tree typically grows anywhere from 66-130 feet high and the trees can live and produce pecans for over 300 years. While often eaten raw pecans greatest use may be in the making of dessert dishes. The seeds, which has become known as the nut, has a distinct buttery and rich flavor and it is this flavoring that makes it a favorite for sweet tooths and has helped to popularize the always delicious dessert favorite pecan pie. In addition pecans are used in the making of the candy pralines and it also can be used as a wood, often making furniture and flooring. Kitchen Pharmacy: Pecans are known to be a great source of energy and are very high in monounsaturated fats which are healthy. Pecans are believed to be beneficial in lowering blood pressure as well as cholesterol and also are believed to help prevent cardiovascular disease. In addition, pecans are linked to helping prevent breast and prostate cancer.